Why insulate the attic floor? Heat rises – to prevent unnecessary heat loss, one of the most financially rewarding energy efficient measures a home owner can take is to insulate their attic. If modern guidelines are followed a 150mm layer of insulation should be placed between the timber joists running across the attic floor and another 150mm should be placed above this in a crossed format. e.g. If the layers between the joists are layed east-west the crossed 2nd layer would be layed north-south. Any more than this total 300mm insulation depth would be almost overkill as the effectivesness of additional insulation would be minimal and not likely to be cost effective. There are those out there who would like to insulate their attic space, especially after a winter of freezing pipes and water damage. There is a worry though that the information they are getting is not sufficient. Insulation stops a transfer of temperature from one space to another. 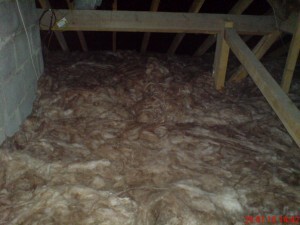 When we insulate we normally want to prevent heat from passing into the attic or out through our walls. Therefore, to insulate the eves or ceiling of the attic is an exercise without much need or merit. they have fully insulated all pipework and tanks in the attic which may now experience lower temperatures in winter due to less heat transfer from the rooms below. Attic well insulated using an insulation material made from recycled glass bottles. This is not to say that a person should never insulate the upper part of their attic, just that it is a step further than is necessary in most cases. If pipework and tanks can be properly insulated to prevent cracking, as many people experienced in Ireland over the past few winters, the extra expense may not be necessary. A good way to be sure is to contact your house insurer and ask them if such work would reduce your premium, also you could contact an architect, a reputable insulation specialist or an engineer with relevant experience. A BER assessor could also possibly be in a position to advise. is 150mm enough to insulate an attic? The above was put into a search engine by one of ENERGY EFFICIENT IRELAND'S readers. The answer is pretty simple. It is a lot better than no insulation but it is not the best solution. This is of course presuming that the reader is using standard insulation rolls. There are many different insulation options available and so the person in question would need to give more detail on their specific building. If you have any queries similar please log in and post your question.